Everybody loves a party…food, fun, friends …what’s not to love? What about when the food you bring is jostled about on the way there… smashed, dented or tossed out of its container altogether? That’s no fun at all. Joy thought there was a better way; and, she was right. We developed the Party Traveler because Joy wanted a neat, convenient way to transport deviled eggs to parties. We designed the versatile product to do that…and much more. The finished design includes a universal base, egg tray, cupcake/muffin tray, pie/cookie/cake tray, veggie/chip tray and a transparent locking lid. The veggie, pie and cookie trays rotate, and all the trays stack neatly inside the lightweight unit for compact storage. 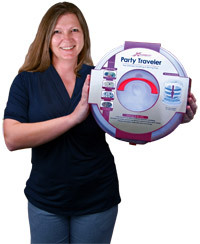 The Party Traveler has been marketed by QVC as the “Party on the Go Food & Dessert Travel Caddy.” It also has been sold in stores, including Joann Fabric and Montgomery Ward.